Article written by Jim Secosky. Jim is a retired science teacher who has used the Hubble Space Telescope, the Mars Global Surveyor, and HiRISE. 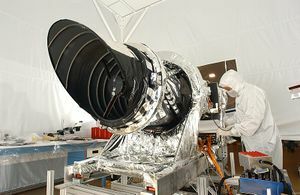 The following group of images shows some significant images taken by the instrument. Some of them hint at possible sources of water for future colonists. Close view of possible pingo with scale, as seen by HiRISE under HiWish program Pingos may contain a core of pure ice. Close view of mantle Mantle may be used as a water source by future colonists. Color view of dunes defrosting Ice is in the toughs of the polygons. Exposed ice in small craters Ice had almost disappeared when the second picture was taken. This set of images is good evidence that ice lies under a thin layer of debris. Layers Layers may form with the aid of water. Evidence of a tsunami caused by an asteroid striking ocean on Mars. These channels were created from the backwash of the giant wave. Most pictures from spacecraft have some sort of enhancement. For many views of Mars there is not much contrast so the contrast is enhanced in a process known as stretching. The darkest parts are set to black while the lightest parts are set to be white. As a result of this process, many features appear much darker. Much of Mars is covered by a brown/red dust that gives little contrast. Pictures would be very bland. The colors for HiRISE images are different than the human eye would see. HiRISE only sees in 3 colors and sometimes infrared is used rather than red. Displaying colors in this way allows us to better identify rocks and minerals. Usually, color images are constructed in one of two ways. An IRB image assigns the output from the infrared channel to the color red, the wide red channel to the color green, and the blue-green channel to the color blue. On the other hand, a RGB image has the output of the broad red channel displayed as red, the blue-green channel as green, and a synthetic blue channel (blue-green minus part of the red) as blue. The wavelengths of these channels are: RED: 570-830 nanometers BG: <580 nanometers IR: >790 nanometers. One nanometer is equal to one billionth of a metre (0.000 000 001 m). HiRISE images are about 5 km wide with a 1 km wide band in the center that is in color. Red color images are at 20,048 pixels wide (6 km in a 300 km orbit), and blue-green and NIR are at 4,048 pixels wide (1.2 km). These are gathered by 14 CCD sensors. HiRISE's onboard computer reads out lines of pixels in time with the orbiter's ground speed; consequently, pictures are potentially unlimited in height. However, height is restricted by the onboard computer's 28 Gigabit (3.5 GByte) memory capacity. The typical maximum size of red images (compressed to 8 bits per pixel) is about 20,000 times 126,000 pixels, or 2520 megapixels and 4,000 times 126,000 pixels (504 megapixels) for the narrower images of the B-G and NIR bands. A single uncompressed image uses up to 28 Gb. However, these images are transmitted compressed, with the usual size being 11.2 Gigabits. These images are released to the general public on the HiRISE website via a new format called JPEG 2000. The full image includes a scale bar of 500 or 1000 meter length. The following set of pictures show first a full image of a scene and then enlargements from parts of it. A program called HiView can be used to produce more detailed views. Some pictures are in color. HiRISE takes a color strip down the middle only. Wide view of layers Parts of this image are enlarged in the following images. The scale bar at the top is 500 meters long. Enlarged view using HiView of mound Only part of the picture is in color because HiRISE only images an center strip in color. Close view of layers Picture enlarged using HiView program. To facilitate the mapping of potential landing sites, HiRISE can produce stereo pairs of images from which the topography can be measured to an accuracy of 0.25 meter. HiRISE is basically a telescope in a low orbit around Mars; consequently, it can provide unbelievable views of the Martian surface. It is far better than all the other cameras that have gone there to look at the planet. This section displays pictures from a variety of cameras on past spacecraft. 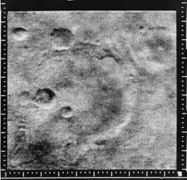 Mariner Crater, as seen by Mariner 4. This may be the best picture that our first spacecraft to fly by Mars took. Image located in Phaethontis quadrangle. Map showing location of Mariner Crater and other nearby features Black box shows location of enlarged views that were taken with HiRISE. Wide angle view of part of Mariner Crater with black and red boxes showing locations of close up views Picture taken with CTX. The area in the red box is shown below in a HiRISE image to contain a group of gullies. Enlargement of troughs from previous image of Mariner Crater. Possible gullies are visible on north wall. This image was taken with CTX camera (on Mars Reconnaissance Orbiter). The location of this image is in the lower black box in the wide view above. Gullies on the wall of a crater on the floor of Mariner Crater. Some of these gullies were also imaged with HiRISE. Note: this is an enlargement of a previous CTX image. Crater wall inside Mariner Crater, as seen by HiRISE. Note: This is an enlargement of the previous CTX image. This crater sits on the floor of Mariner Crater. This image is from the area in the red box in the wide view shown previously. The next two images compare pictures taken with 7 different cameras. HiRISE clearly has the best view of the surface. Wide view of portion of Memnonia quadrangle Arrows show locations of images from various cameras. The images from these cameras are shown in the following image. The 7 cameras are HiRISE (Mars Reconnaissance Orbiter), THEMIS VIS (Mars Odyssey), MOC-WAC (Mars Global Surveyor), HRSC (Mars Express), CTX (Mars Reconnaissance Orbiter), Viking, Mariner 4. Composite demonstrating relative resolution of 7 different cameras that imaged Mars: HiRISE (Mars Reconnaissance Orbiter), THEMIS VIS (Mars Odyssey), MOC-WAC (Mars Global Surveyor), HRSC (Mars Express), CTX (Mars Reconnaissance Orbiter), Viking, and Mariner 4. Location is Memnonia quadrangle. Blue arrow on some pictures points to same location at with different cameras. Red box with CTX image shows location of the next frame from HiRISE. 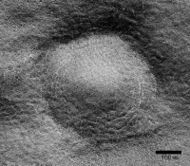 As of March 9, 2016, the 10 year Anniversary of MRO, over 2.4 % of the surface has been examined by HiRISE. That is about the area of two Alaska’s. More would have been looked at, but many places were imaged multiple times to look for changes in things like sand dunes, gullies, and streaks. Pictures could contain up to 28 gigabits (Gb) of data. 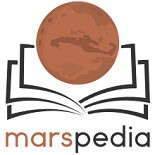 The highly successful mission of Mariner 9 changed many of our ideas about the Red Planet, yet it returned only 7,329 images with a total of 40 Gb of data, according to the final report. So just 2 HiRISE images may contain more than the entire Mariner 9 mission. At the time of this writing (10/17/18), 62,132 HiRISE images have been taken. On another note, the first image sent from Mars by Mariner 4 in the summer of 1965 only contained 240,000 bits. One HiRISE image could contain 16,666 as many bits as that Mariner image. Images can be seen at the HiRISE site at http://hirise.lpl.arizona.edu Clicking on the” Catalog” tab at the top will take you to all the HiRISE images. Clicking on the “Caption” tab takes you to hundreds of captioned images that are available in over 20 languages. If you know the image number, you type it in the search box to see it. To see spots in various enlargements, you can download the “HiView “ program that is found on the home page. The “map” tab will allow you to use a map to find HiRISE images of certain areas. For those interested in further understanding Mars, the “Science Nuggets” tab contains posters describing published research using HiRISE. “Updates” shows the latest captioned releases. To see interesting products made with HiRISE images check out the “Special Releases” tab. Several show rovers, such as Opportunity and Curiosity on the surface. One of the most beautiful products created with HiRISE are “Digital Terrain Models.” In a complex, time-consuming process images of the same spot on Mars are taken from slightly different angles. What results is a colorful topographic view. They can be seen with the “DTM” tab. Over 560 have been made so far. On April 1, 2010, NASA released the first images under the HiWish program in which the public suggested places for HiRISE to photograph. One of the eight locations was Aureum Chaos. The following three images relate to the first images taken under the HiWish program. The first image below gives a wide view of the area from CTX to show where the HiRISE is looking. THEMIS image of wide view of following HiRISE images. Black box shows approximate location of HiRISE images. This image is just a part of the vast area known as Aureum Chaos. Click on image to see more details. Aureum Chaos, as seen by HiRISE, under the HiWish program. Image is located in Margaritifer Sinus quadrangle. Close up view of previous image, as seen by HiRISE under HiWish program. Small round dots are boulders. Thousands of pictures have been taken under the HiWish program which has given everyone the privilege of exploring Mars with the best telescope/camera to ever study the Red Planet. The following are other images taken with HiRISE under the HiWish program. Streamlined shapes created by running water that went from the bottom to the top of the image. ↑ Lyons, Daniel T. (August 5–8, 2002). "MARS RECONNAISSANCE ORBITER: AEROBRAKING REFERENCE TRAJECTORY" (PDF). AIAA/AAS Astrodynamics Specialist Conference and Exhibit. Archived from the original (PDF) on October 18, 2011. Retrieved March 9, 2012. ↑ Mars orbiter prepares for next year's InSight lander arrival. July 29, 2015. ↑ Techinical Report 32-1550. Volume III. Mariner Mars 1971 Project Final Report. What Mars Actually Looks Like! This page was last edited on 8 February 2019, at 13:01.